Even as a seasoned cloth diaperer, I am a little shocked at the amount of choices flooding the cloth diaper market these days. In just three short years from when I began looking into diapering options for my daughter, the industry has catapulted into popularity, and now so many companies offer what can seem like an overwhelming selection. For instance, just three years ago there were basically two diaper pail liners to choose from, and companies like Kissaluvs only had fitteds, Rumparooz mostly had pockets, etc... Now just about every manufacturer has its own pail liner, every type of diaper all the way up to trainers, every accessory from diaper sprayers to flushable liners to detergent and more. Not to mention there are an ever increasing number of new companies and WAHM-made diapers hitting the market everyday. Point being...I cannot even begin to cover them all. Every avid cloth diaperer has their own go-to favorites that they swear by, so I can only speak of what I've tried, and what I love. I will start with the basics - diaper inserts and doublers. 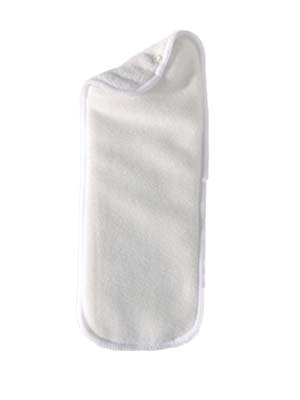 They are useful in every type of diaper - not just pockets, but even fitted and all in one/two users will find themselves needing extra absorbency at times, or even stay dry inners. I am very partial to natural fibers, particularly bamboo. It is my favorite material for inserts and doublers, and I think the most absorbent. The next would be organic cotton, and finally hemp. I've tried microfiber, and even combinations of microfiber with hemp, and natural fibers just always seemed (to me!) to have it beat in absorbency and trimness. As with all natural fiber cloth diaper products, it is important to prep them first with at least 4-5 complete wash and dry cycles to wash off any oils and also to shrink up the fibers a bit and pull them together to create better absorbency. We always needed a stay dry layer, as my daughter's skin is super sensitive. I found that I preferred to have a little something extra attached to the fleece stay dry layer, because those flimsy fleece liners would either get scrunched up and leave her red in spots anyway, or more importantly, they are extremely difficult to spray clean. I preferred using trim stay dry doublers that had hemp backing on the fleece, which solved both those problems and added absorbency as well. 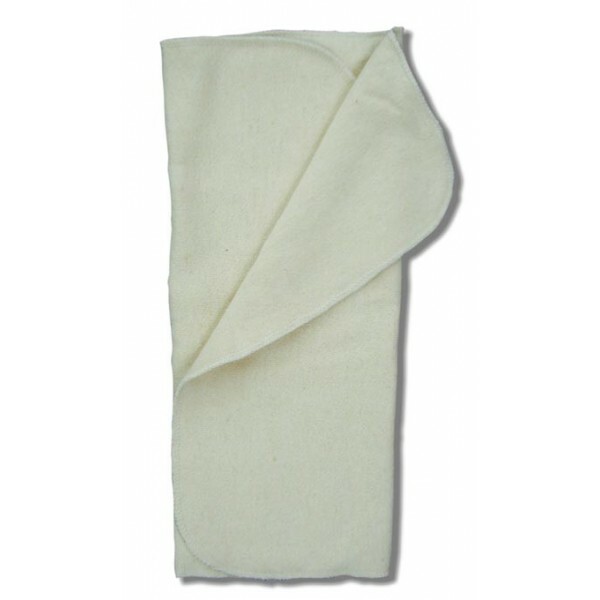 AppleCheeks One-Size Rayon from Bamboo Insert - you just cannot beat the trimness and absorbency of these inserts. 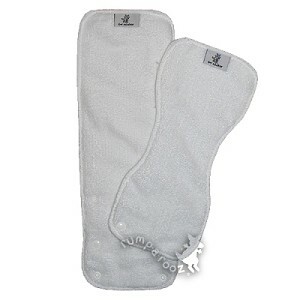 I mostly used these with just the single lengthwise fold in the size 2 AppleCheeks (my favorite pocket, by the way! ), but now I think my very nicely shrunken inserts will still be trim with a tri-fold for the size 1's if we ever have another child. These do get more tightly knit and smaller with the first couple dozen washes, which makes them trimmer and more absorbent. These served us well and were my go-to insert from about 6 months (would've been sooner but that's when I first got them) until around age 2. Then even with an added AppleCheeks doubler I needed a little more absorbency, but trimness was no longer an issue with a tall two year old so we could move on to thicker inserts. The only con to these was that since I use my dryer to dry, they shrunk so much that even with a girl I always had to make sure I had the insert all the way up front, as they eventually did not span the complete length of the size 2 diapers. However, as long as it was stuffed all the way up front it wasn't too much of an issue. They also make a 3 layer insert, but at that point I wanted to find something longer. Rumparooz 6r BAMBOO Soaker - This soaker comes in several materials, but I've only tried the bamboo and I love it! This was long enough to get end to end in my AppleCheeks, and so, so, so absorbent! They have fold down snap settings and are adjustable for smaller sized pocket diapers, and also come with a snap-on newborn insert. These trim up SO MUCH with washing. I'd say they are half the thickness now than they were when I brought them home. They lose a little bit in length and width as well, but mostly in thickness. After at least a year of use my full size inserts are approximately 14.25 x 5 inches and 3/16 of an inch thick, and the newborn inserts are approximately 11.75 x 5 inches at the widest point, 3.25" across the center, and maybe 1/8 of an inch thick. I love the two piece system too. I use the main insert in my pockets, and the mini newborn insert to add absorbency to just about anything - but mostly to add to my nighttime diapers. 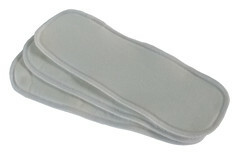 I really hope we get to try those newborn inserts on an actual newborn, because they are insanely trim and unbelievably absorbent for how thin they are. I can use the two paired inside an EcoPosh fitted and they will go all night, even for my nearly 3 year old. Flip Organic Cotton Insert - This is the original insert (now being marketed as a nighttime insert), not the new and recently released daytime insert. I had actually tried one of these when my daughter was about 6 months old, and sold it because it just did not compare to the trimness of my beloved AppleCheeks inserts at the time. However, fast forward a year and a half later when my daughter was a lot taller and we needed more absorbency, and I think these are just about as absorbent as the Rumparooz, but I wouldn't trust them overnight (now for an almost 3 year old - I'm sure they would've been great overnight when she was younger!) and they are not as trim as the Rumparooz. Again, the lack of trimness is not an issue with an almost 3 year old. The only thing I didn't like is that they shrunk up into a square (mine are now approx 14.25 x 14.25 inches), making their whole thing about being able to adjust from small to large by changing the direction completely impossible, but they will hold a ton of pee. nearly 3 years of almost constant use, these are still in fabulous shape but they are a lot thinner than when I bought them. They are now approximately 12 x 5 inches and 1/4 inch thick (again, after almost 3 years of use). Even initially I'd say they went down to about half their thickness after a few dozen washes. I wish BabyKicks would make these in more sizes like the Premium JoeyBunz, which I tried in both the small size early on and the large size about a year ago, but don't think hold nearly as much. Sure, the JoeyBunz are super trim, but I almost think they're too thin and don't hold enough. Those doublers though - durable, useful and really soak up a lot. BabyKicks Hemp Doublers - in case you skipped the section above just looking for doublers, please see just above in the insert section. Sustainablebabyish Bamboo Fleece Doublers - Generally, since we always needed a stay dry layer, if I was going to bother with a doubler it was usually fleece covered, but as my daughter grew that was not always enough. If you're looking for a skinny, crazy absorbent doubler that can transform some diapers into a nighttime diaper, then this is your doubler. They even make them in an extra small size now for newborn diapers! 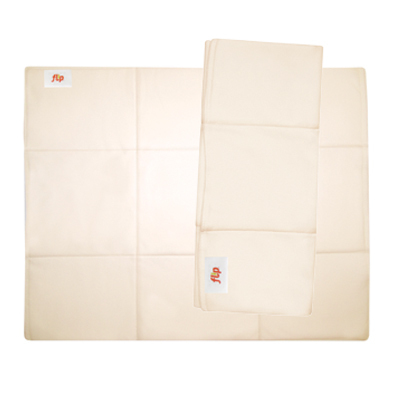 These are the same doublers that come with their famous organic bamboo fleece fitted diapers, which are hailed as the "magic" diaper by many, and with reason. It is a savior for many for nights, and was for us as well. (more on that in my post on fitted diapers later!) 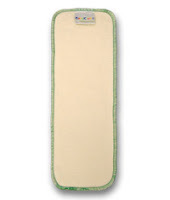 Plus, Sustainablebabyish makes durable, superior products and has phenomenal customer service. Knickernappies Stay Dry Hemp Doublers - I love, love, love these doublers! They are ridiculously trim, have a stay dry fleece lining and actually hold a good amount for how thin they are. The hemp layers help keep the stay dry layer in place, and are much easier to hose poop off of than a thin, flimsy single layer of fleece. These are hard to find these days, and the manufacturer website carries them, as well as Diva Diapers. Green Mountain Diapers (GMD) Stay Dry Doublers - When I couldn't find my favorite Knickernappies doublers and the fleece started wearing out after almost 2.5 years of constant use, I tried these. They are thicker than the KN doublers, but are starting to trim up substantially after a few months of use. I got a few of each size. I love the smalls to fit inside my extra trim fitteds like Sustainablebabyish HLC's (my favorite fitted, by the way!). They fit perfectly! Diapers with a skinny width between the legs can be great trimness wise, but difficult if you absolutely need a stay dry layer. The larges fit in many of my large and extra large fitteds, and the nighttime size is quite large. It does fit in my large Loveybums fitteds, but would definitely only fit in size large or extra large diapers. These are not as absorbent as I had hoped for the thickness, but as I said, they are just now really starting to get trim, which also tends to mean they are getting more absorbent. The fleece is thicker than I remember my KN doublers starting with, but it really is an exceptional quality fleece. I really, really love the small size in all my skinny fitteds! I also think the small size would be an excellent newborn insert popped inside a cover with nothing else. NOTE: These eventually got nice and trim and very absorbent! Softbums DryTouch Mini Pods (stay dry microfiber) - I know I spoke of natural fibers and these are microfiber, but I absolutely must mention them, because these are the only thing in my stash that I can say have been in constant use since day one, and they are still kicking! 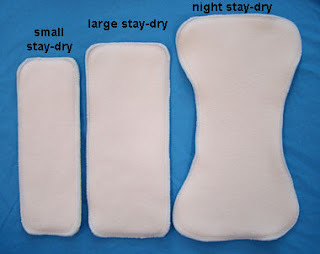 I was really NOT a fan of anything else Softbums - I hated the super long insert that you'd have to keep from falling in the toilet, and even my daughter who was off the charts (on the high end) for both height and weight had these just sagging between her legs with all that insert in there. But... the newborn pods I kept because they are extremely handy. They've thinned out too, but they fit in everything for a nice stay dry layer with enough heft to help keep them in place to wash off poop. They fit great in skinny diapers as well - even Bottombumpers all in ones (my favorite AIO, by the way! ).